Image © [caption id="" align="alignleft" width="315" caption="Andrew Lansley, Secretary of State for Health visits Queen Elizabeth Hospital Birmingham."] [/caption] From the 24th January the Guardian has a fair few articles reporting on the opposition Andrew Lansley's NHS reforms face, for example UNISON, BMA and MIND are against the original Health and Social Care Bill. There have been many amendments to the Bill, which is going to the House of Lords on the 8th February, yet there are still major concerns with the Health and Social Care Bill as it stands. While the BMA has been known to oppose change to medical health,the Royal College of GPs, meant to be some of the beneficiaries of this Bill, are also against it. The Lancet, the world's leading medical journal, which has even published an article on how the Bill would destroy the comprehensive and free nature of our healthcare system. With so much talk about this Bill by so many, it makes me wonder what the contents of the Bill are able to rile up so many into widespread opposition. According to the Department of Health (DH) there are 5 key themes to this Bill; which intend to improve healthcare provision and healthcare services in the UK. 1. "Increasing democratic accountability and public voice": the Bill is aiming to empower patients and provide a strong forum to allow the voicing of thoughts on the NHS, and be included in the decision-making process relating to all aspects of the NHS. The Bill has created HealthWatch; a new national organisation in which patients will be able to give feedback on the health and social care services they receive and shall use this data to inform and advise people making decisions. HealthWatch has already been setup and is pioneering plans to have local HealthWatch organisations nationwide by October 2012. As for greater accountability: the Secretary of State is ultimately accountable for the NHS though the powers to micromanage will be limited, and Ministers will set the design and strategic direction of the system - while remaining accountable for them. The NHS Commissioning Board (NHSCB) will be accountable to the Secretary of State and the Clinical Commissioning Groups (CCGs) will be accountable to the NHSCB. 2. "Reforming health and care arm's-length bodies": 'the what now? ', does anyone know what they are?' According to the DH, there are 3 types of arm's-length bodies (ALBs) working with them; executive agencies, special health authorities and non-departmental public bodies - also known as quangos if you were wondering what a quango was. The aim here is to reorganise the public bodies working with the DH in order to make the duties and responsibilities of the public bodies clearer, and to increase the proportion of money going to front line services by cutting bureaucracy costs. This means some public bodies may be abolished in order to achieve the streamlining of ALBs. The General Social Care Council shall be abolished, as will the Office of the Healthcare Professions Adjudicator and the Alcohol Education and Research Council. The Council for Health Care Regulatory will become self-funded, and NICE and the Information Centre are to be given greater autonomy. 3. "Liberating provision of NHS services": my automatic response to this is 'from what? all the red tape?' In all seriousness, the liberating here is opening up of healthcare to many providers in order to promote choice of high quality healthcare and will lead to competition. This choice and competition while be observed by Monitor, an independent regulator of NHS Foundation Trusts. Monitor will provide licenses to providers so there is no 'free-for-all' for private healthcare providers and will make sure there is no prevention of competition, though Monitor will have to follow EU and UK competition and procurement legislation. Monitor, in conjunction with the NHSCB, will regulator prices for NHS services to prevent 'cherry picking' by other healthcare providers. 4. "Strengthening commissioning of NHS services": the CCGs will be commissioning NHS services, led by GPs in order to empower healthcare professionals so they can make improve the NHS services. With CCGs being universal - all GP practices will collaborate with each other and are responsible for commissioning service they believe are appropriate in order to reduce health inequalities. 5. "Strengthening public health service": I'm assuming this is what the Bill in its entirety is hoping to achieve. This is a bare bones look at the Bill and often it a summary of the linked documents, so looking at them in their entirety is recommened. If you still want to know more, I would suggest looking at the Health and Social Care Bill as it stands - though I warn you there are a lot of pages to read. NHS Reforms: Just what is Andrew Lansley proposing? 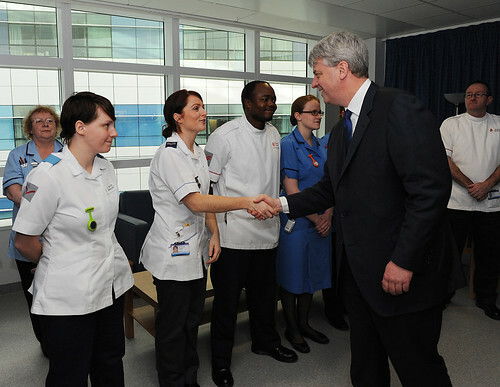 Andrew Lansley, Secretary of State for Health visits Queen Elizabeth Hospital Birmingham. From the 24th January the Guardian has a fair few articles reporting on the opposition Andrew Lansley’s NHS reforms face, for example UNISON, BMA and MIND are against the original Health and Social Care Bill. There have been many amendments to the Bill, which is going to the House of Lords on the 8th February, yet there are still major concerns with the Health and Social Care Bill as it stands. While the BMA has been known to oppose change to medical health,the Royal College of GPs, meant to be some of the beneficiaries of this Bill, are also against it. The Lancet, the world’s leading medical journal, which has even published an article on how the Bill would destroy the comprehensive and free nature of our healthcare system. With so much talk about this Bill by so many, it makes me wonder what the contents of the Bill are able to rile up so many into widespread opposition. According to the Department of Health (DH) there are 5 key themes to this Bill; which intend to improve healthcare provision and healthcare services in the UK. 1. “Increasing democratic accountability and public voice“: the Bill is aiming to empower patients and provide a strong forum to allow the voicing of thoughts on the NHS, and be included in the decision-making process relating to all aspects of the NHS. The Bill has created HealthWatch; a new national organisation in which patients will be able to give feedback on the health and social care services they receive and shall use this data to inform and advise people making decisions. HealthWatch has already been setup and is pioneering plans to have local HealthWatch organisations nationwide by October 2012. As for greater accountability: the Secretary of State is ultimately accountable for the NHS though the powers to micromanage will be limited, and Ministers will set the design and strategic direction of the system – while remaining accountable for them. The NHS Commissioning Board (NHSCB) will be accountable to the Secretary of State and the Clinical Commissioning Groups (CCGs) will be accountable to the NHSCB. 2. “Reforming health and care arm’s-length bodies“: ‘the what now?’, does anyone know what they are?’ According to the DH, there are 3 types of arm’s-length bodies (ALBs) working with them; executive agencies, special health authorities and non-departmental public bodies – also known as quangos if you were wondering what a quango was. The aim here is to reorganise the public bodies working with the DH in order to make the duties and responsibilities of the public bodies clearer, and to increase the proportion of money going to front line services by cutting bureaucracy costs. This means some public bodies may be abolished in order to achieve the streamlining of ALBs. The General Social Care Council shall be abolished, as will the Office of the Healthcare Professions Adjudicator and the Alcohol Education and Research Council. The Council for Health Care Regulatory will become self-funded, and NICE and the Information Centre are to be given greater autonomy. 3. “Liberating provision of NHS services“: my automatic response to this is ‘from what? all the red tape?’ In all seriousness, the liberating here is opening up of healthcare to many providers in order to promote choice of high quality healthcare and will lead to competition. This choice and competition while be observed by Monitor, an independent regulator of NHS Foundation Trusts. Monitor will provide licenses to providers so there is no ‘free-for-all’ for private healthcare providers and will make sure there is no prevention of competition, though Monitor will have to follow EU and UK competition and procurement legislation. Monitor, in conjunction with the NHSCB, will regulator prices for NHS services to prevent ‘cherry picking’ by other healthcare providers. 4. “Strengthening commissioning of NHS services“: the CCGs will be commissioning NHS services, led by GPs in order to empower healthcare professionals so they can make improve the NHS services. With CCGs being universal – all GP practices will collaborate with each other and are responsible for commissioning service they believe are appropriate in order to reduce health inequalities. 5. “Strengthening public health service“: I’m assuming this is what the Bill in its entirety is hoping to achieve. This is a bare bones look at the Bill and often it a summary of the linked documents, so looking at them in their entirety is recommened. If you still want to know more, I would suggest looking at the Health and Social Care Bill as it stands – though I warn you there are a lot of pages to read.